Montreal’s Biodome was built as a velodrome for the 1976 Olympic Games and was converted into a natural science museum in 1992. The Biodome includes four ecosystems: the Tropical Rainforest, the Laurentian Maple Forest, the St. Lawrence Gulf, and the Sub-Polar Regions. Together, these host over 4,500 animals from 250 different species. As part of a citywide plan to celebrate Montreal’s 375th anniversary in 2017, the museum last year launched an international competition to renovate the Biodome interior. KANVA and NEUF’s winning entry rethinks the relationship between humankind and nature, and bolsters the centre’s educational mission. The revitalization strategy treats the existing facility as a living organism. A continuous curved wall fluidly wraps each ecosystem like a skin. Referencing the building’s history of hosting cycling races, the floor-to-ceiling walls sweep through the interior space, serving as a canvas that accompanies visitors through the building’s many pathways and leads them back to a new central hub. Pure in both form and colour, the white skin isolates the ecosystems and contrasts with the robust concrete architecture of the velodrome. The skin becomes a neutral yet bold intermediary between two important elements—the building and the exhibition zones. The clean membrane invites introspection in the moments between visits to the sensory-stimulating, animal-filled environments. Within the ecosystems, the new conceptual strategy creates immersive and intimate experiences, bringing more awareness to visitors during their journey. 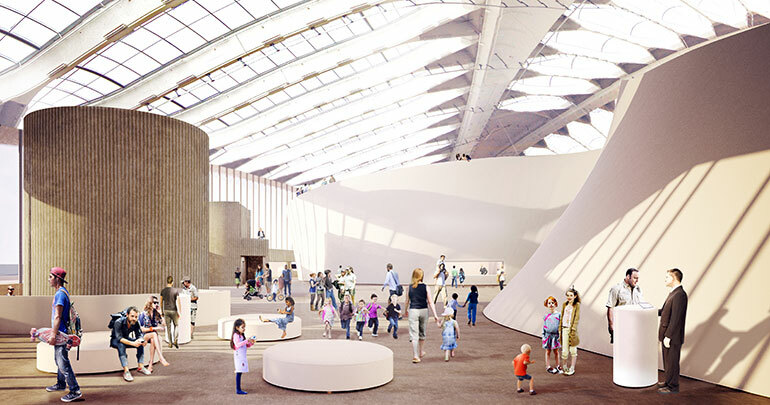 Outside of the ecosystems, the plan reorganizes many of the public spaces on the main floor, freeing up the grand hall and extending a new central hub to the ceiling. Making use of the Biodome’s height, a mezzanine is added above the redesigned Sub-Polar Regions, framing the impressive ceiling structure and offering new vantage points for visitors and staff. New passages from two of the ecosystems service this mezzanine, allowing visitors a more diversified trajectory and additional points of rest to punctuate their visit. The skin is made from a textile that can curve and take on many forms, preventing unnecessary demolition of the fragile ecosystems and existing infrastructure, including a newly optimized mechanical system. The textile’s flexibility allows it to occupy residual and awkward spaces, unifying the irregular perimeters of each exhibition. The skin disguises most of the Biodome’s unsightly mechanical equipment, redirecting the visual focus of visitors up to the heritage structure’s luminous skylights. The system’s thin profile and lightweight structure allow for installation with little noise, keeping disruption to the animals and their environments to a minimum. In addition to making better use of the velodrome’s skylights, the design celebrates the existing heritage building in several ways. The amphitheatre is relocated along the building’s edge to free up the central hub, and makes use of the velodrome’s original spectator stands for seating. In the newly opened atrium, two concrete staircases from the velodrome become important anchors in the space. Overall, the scheme offers a comprehensive and multi-disciplinary approach that both enhances the existing heritage building and expands the programmatic functions of the Biodome. MF: The challenge that the designers had to face in reorganizing the existing main components was very difficult. Their solution brings a sense of playfulness to circulating around this building. They have chosen a good strategy to create a strong promenade. PH: This project inserts strategically sculpted walls that capture views of the sky like a James Turrell structure, editing what is already present. The intervention is a kind of syncopation as you move through the four exhibits—your sensory experience is completely different when you’re passing through the paired walls. Understood in relationship to the ceiling structure of the existing building, the plan with its extruded walls is quite profound. JH: There’s a consistency and clarity to the overall approach that adds legibility to the existing piece. It’s a good example of how to intervene with such a specific building. We have many big, iconic buildings across Canada that would benefit from new intervention and reuse strategies with this kind of sensibility. ARCHITECT TEAM KANVA—Rami Bebawi, Tudor Radulescu, Minh-Giao Truong, Katrine Rivard, Olga Karpova, Killian O’Connor, Léon Dussault-Gagné, Dina Safonova, Joyce Yam, Dale Byrns, France Moreau, Gabriel Caya, Eloïse Ciesla. NEUF architect(e)s—Azad Chichmanian, Marina Socolova.